I would like to thank Dafina, for sharing this incredibly passionate piece, which is very appropriate for Ovarian Cancer Awareness Month. “My name is Dafina and I’m 39. Four years ago, I was living a normal life and doing all the things that young people do. But while I was planning my future, I didn’t know my life was already in danger. I had no idea I was carrying a growing tumour, eventually weighing 500g. In July 2014 I started becoming very bloated, which was unusual for me. I saw my GP almost 4 months in a row, but she didn’t touch or examine my abdomen even once and instead sent me to see a gastroenterologist to have my stomach checked. They didn’t discover anything either, and I tried to continue with my life as normal but with the constant bloating. Not long after I went on a holiday to California. As most of us do, I love taking photos when I travel. But this time I started noticing that I looked very different in the photos, I looked drained and exhausted. I even asked the friend I was traveling with not to take any photos of me because I was so worried about the way I was looking. I even started avoiding the mirrors in bathrooms. While I was still on this holiday I bled between my periods; because this had never happened to me before I put it down to the change of climate and travelling. But the month after my holiday I again started bleeding between my periods and then I knew that something was not right. I went to see another GP who referred me to a Gynaecologist. However, in the next few days I had to fly to Macedonia and I was still waiting for the gynaecologist appointment in London. As soon as I arrived in Macedonia, I booked to see a private gynaecologist. They did a proper check-up including a transvaginal ultrasound (complete pelvic examination) and quickly discovered that I had a huge tumour on my uterus, 14cm long. She advised me to have it removed immediately. I was booked in for an operation in 4 days’ time. I was terrified that I would need to have a big operation and the only thing that gave me the strength to proceed with it was that I wanted to protect my uterus so I could still have children one day. After the operation was done, I woke up in intensive care and immediately had to do an X-Ray. After that I was brought to my recovery room in the hospital where my family was waiting. I was looking forward to seeing them but as soon as I entered the room, I could see they looked so concerned and worried. A few minutes later the surgeon entered the room and told me the life changing news. “You have a stage 2 womb cancer and it has spread to your ovaries”. I was devastated and so afraid of what I would hear next… ”Will I survive or do I have just a few days to live?” The surgeon advised me that I must go back into surgery that very evening to remove my uterus and my ovaries, actually to have a total hysterectomy, in order to save my life. This sentence meant the plans for my future, of having my own big family one day, had completely disappeared. I discussed all the options with the surgeon and asked if I could freeze my eggs but as I had a very rare type of cancer called Leiomyosarcoma which was oestrogen receptive, this option was out of the question. It’s been 4 years since then and every day I have to deal with the consequences of early menopause, such as: hot flushes, night sweats, mood swings, vaginal dryness and osteopenia (lower bone density). I am only 39! What happened to me I wouldn’t want to happen to anyone else and especially as this can be prevented simply if detected earlier. Sadly, more and more often we hear that women and girls in the UK are diagnosed too late with some type of Gynaecological cancer. 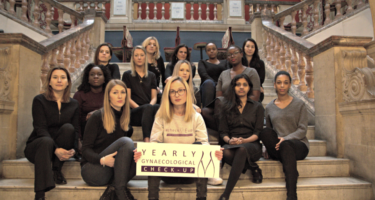 At the moment in the UK the only available test for our reproductive health is the Smear test, but this detects the likelihood of only 1 type of gynaecological cancer which is cervical cancer. 3,000 women are diagnosed every year with cervical cancer but over 18,000 are diagnosed with the other 4 types of cancers. I wonder how many of these women were diagnosed too late? I had my Smear test which showed that everything was normal a few months before my diagnosis of womb cancer. If I had a chance to see a Gynaecologist at least once in the previous years and had a full check-up such as a transvaginal ultrasound my tumour, would have been discovered much earlier and I would have had a chance to remove it before it spread to my other organs. Currently, the UK’s approach to healthcare is reactive, not preventative. The system is symptom-driven, which relies upon us discovering an issue ourselves and then going to our GP. But what if it is already too late by the time the symptoms start to show? In the UK, going to a Gynaecologist is not normal practice and we don’t even talk about it. But yearly gynaecological check-ups are a very normal thing in lots of countries in Europe and worldwide. If this also becomes normal policy in the UK it will save many lives by enabling the early diagnoses of gynaecological cancers that have no screening programmes and also pick up a range of conditions and complications that significantly affect a women’s quality of life (e.g. endometriosis and fibroids). This story makes me very angry. When will the NHS admit that we have the worst cancer care in Europe, and do something to improve. How many more stories like this will come out before we do something? Here is a small, relatively poor European country able to produce better car than we can. It made me angry too Verite. This is becoming such a common issue in this country. Unfortunately the onus is on the patient to become much more vigilant and take charge of their own health. This is proving very difficult for many!